Army Public School Patiala Recruitment 2016 Apply for Counselor, TGT and LDC Jobs. Army Public School Patiala is a higher secondary co-education Government School situated in Patiala. The School is affiliated to the Central Board of Secondary Education. They had recently trumpeted an employment announcement, especially for job seekers in teaching and non-teaching category. Individuals who are endeavored for getting job shall utilize this excellent opportunity. Deserving persons who are keenly waited for this recruitment shall forward your applications through post. The received applications are shortlisted by the selection committee and as soon as those candidates will receive the interview call. For acquiring more knowledge about Army Public School jobs refer the information discussed in this section. Applicants for the position of Counselor should have completed BA degree with Psychology or Graduation with Diploma in Counseling from any recognized institution. Candidate with MA (Psychology) is preferred for the post. 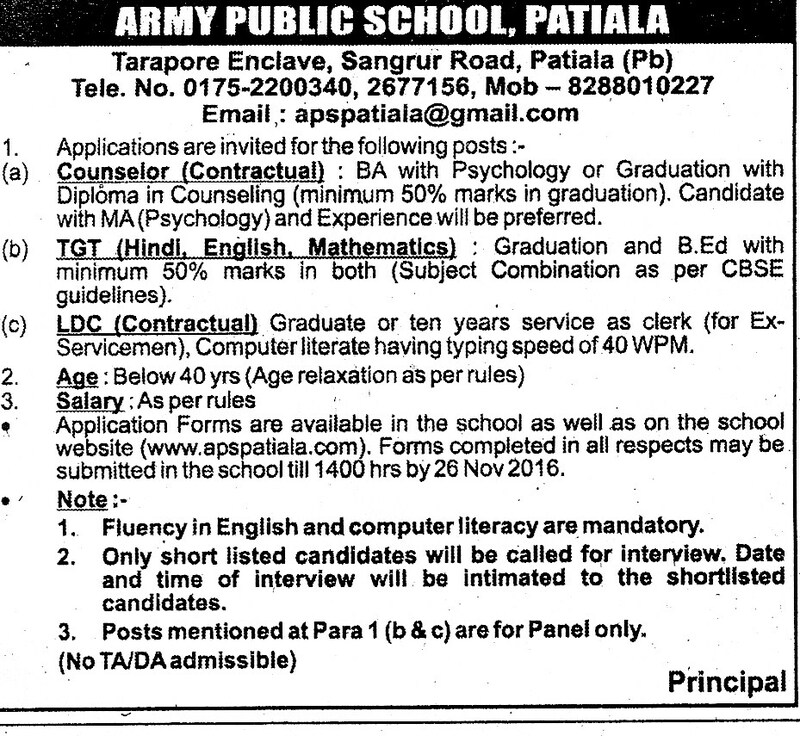 For other Army Public School Patiala Jobs, aspiring individuals should have possessed Graduate Degree. Additionally B.Ed Degree is compulsory for the position of TGT and typing shill for LDC. All those candidates should have secured minimum 50% of marks in aggregate. Age of the persons who desire to apply for the above mentioned Army Public School Patiala Posts must be ceiling on at 40 years. Age relaxation is also permissible as per the rules. Contenders who gave response against the vacancy notification issued by Army Public School Patiala are shortlisted based on their qualifications. Date and time of interview is intimated only for the shortlisted candidates. No travel or dearness allowance is admissible for the attendees of selection. Capable candidates who are selected to work under the posts indicated in Army Public School notification will receive an attractive and impressive salary as per the rules. In order to begin the application process, eligible persons shall download the application form from their website “www.apspatiala.com” or get it from the School. Applicants must submit their applications duly filled along with the attested photocopies of certificates. The envelope with the documents should be addressed to “Army Public School, Tarapur Enclave, Sangrur Road, Patiala”. Processing fee of Rs.100/- will be deposited in APS, Patiala by postal way along with the application form. Note: For the convenience of career seekers, we had discussed about Army Public School Patiala Recruitment 2016 in the above sections. If you need more information, refer their web portal.